Q1: Will rolling my bat hurt it’s durability in any way? A1: No. When your bat is through being rolled it will have all the durability it had before it was done but will be hitting at its true potential. Q2: Can you roll any type of bat? A2: Yes, we can roll slowpitch and fastpitch softball, baseball, and little league bats of any type material. Q3: Does it matter if the bat has been used before being rolled? A3: No, it’s fine to roll bats that have been used. Q4: Will I still see improvement in my bat if it already has 500 or more hits on it? A4: Yes, you may see a little less improvement in distance and pop, but the rolling will remove any dead spots and improve it’s consistency. In addition, many bats still see great improvement depending on the type of material they are made of, the type of balls that have been hit and who has swung it. Q5: What is the turnaround time? A5: We strive for a 2 day turnaround on rolling and 3 days on shaving not including the day we receive the bat. It will be 4-5 days for shipping depending on what shipping option you choose. Please allow us this much time to return your bat to you before contacting us about the status of your order. Q6: What makes you different from other people doing bat rolling? A6: We have been rolling bats for over fifteen years and have discovered many little known techniques for getting the most out of the process. To give you a few examples, most people that are rolling bats are heating them first believing that this will first soften the bat’s fibers, allowing the rolling process to be more successful. Nothing could be further from the truth. Heating a bat will temporarily stretch out the bat’s fibers so that when you roll it you aren’t accomplishing anything. Then, when the bat cools down, the fibers go right back to being stiff and hard. Another example:You will notice in one of the pictures of our machines that we applied some athletic tape on the part of the rollers that make contact with the bat. This will allow the bat to be rolled without marring it. Most bats that have been rolled are obvious because of the marks on it. Lastly, and probably most important, we have experience with all the different brands and types of bats out there. There is a lot of variance on how much pressure to apply to different bats. Don’t let someone experiment on your $300 bat! We re-roll several bats a week that have been previously rolled by someone else who didn’t know how to do it correctly. Most of the people doing this decide how much pressure they’re going to give a bat and start out right at that pressure, run the bat through the machine once and they’re done. This is what causes bats to break or the paint to spider web. When we roll a bat we take the pressure we are going to end up at, divide it by four and start there. Then, each successive cycle we adjust the pressure up by 25% . So by the time the bat sees it’s max pressure it is ready for it. By rolling a bat this way it will make 160 passes through the machine. This process takes much longer than most people are willing to take. 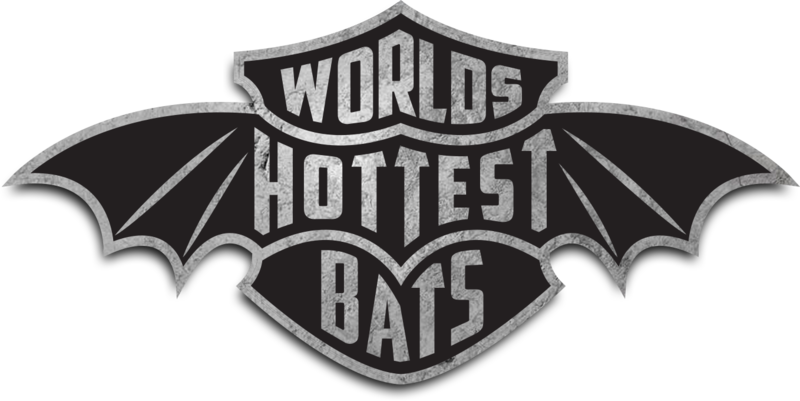 Worlds Hottest Bats, LLC has been built up over time by giving great customer service and doing quality work. Most of our customers are repeat customers. We are referred by many sporting goods stores and online websites. We roll bats for many bat company sponsored teams like Miken, Worth, and Easton who would rather send us their bats than let the local guy do them. Q7: If I take a 30 oz bat and shave it down to a 26 oz bat will that make it hotter than shaving a lighter bat of the same type? A7: This question comes from a misunderstanding of how bats are constructed. The main shell of the bat is the same weight whether the bat has a sticker weight of 26 oz 27 oz etc. The manufacturers make the bats heavier by adding handle and endload weight in the proper ratio to keep the bat’s balance point the same. In other words, a 27 oz bat will have 1/2oz of handle weight and 1/2oz of endload weight more than a 26 oz bat of the same type. The wall thickness is the same on both bats. The amount of material shaved out of bats of the same type with different weights is therefore the same. Q8: What does it mean on the shaving release form when it asks for the finished weight?